There was a brief debate focused on the following question: would the gains of the economy continue to accrue to the top 1% once the recovery started, or would the top 1% have a weak post-recession showing in terms of raw income growth as well as income share of the economy? The top 1% had a rough Great Recession. They absorbed 50% of the income losses, and their share of income dropped from 23.5% to 18.1% percent. Is this a new state of affairs, or would the 1% bounce back in 2010? 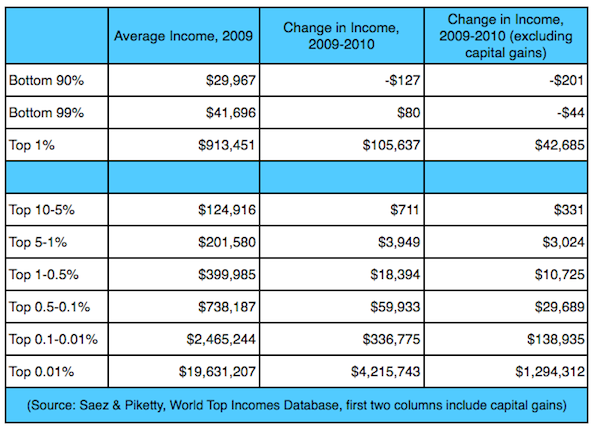 The bottom 90% of Americans lost $127, the bottom 99% of Americans gained $80, and the top 1% gained $105,637. The bottom 99% is net positive for the year because of around $125 in average capital gains. They can take comfort in efforts by the Right to set the capital gains tax to 0%, which would have netted them an additional couple dozen bucks. And if this wasn’t obvious, you can see the gains become quite high the further you walk up the inequality ladder. When we discuss things like the Buffett Rule, or taxing capital gains as ordinary income, it is important to see how top-heavy that capital gains distribution actually is. 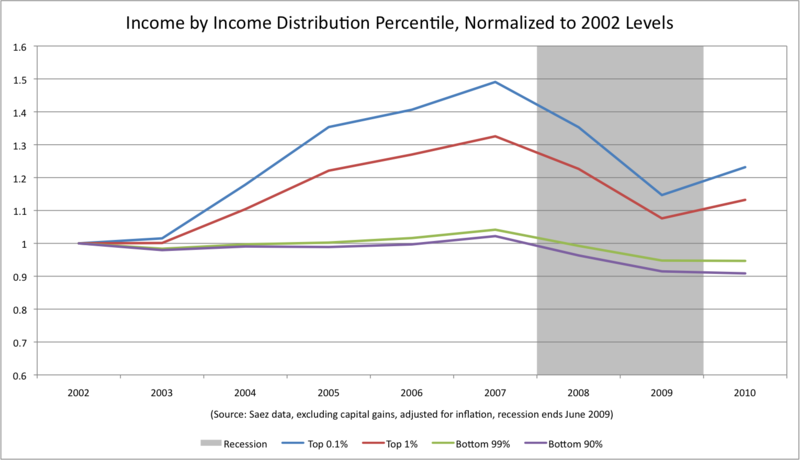 The Great Recession dropped income for the bottom 99% by 11.6%, completely wiping out the meager gains of the Bush years. And crucially, while 2010 was a year of continued stagnation for the economy as a whole, the 1% began to show strong gains, even when you exclude capital gains. There’s two things worth mentioning. There’s an interesting debate within left-liberal circles on whether or not elite economic interests benefit from a weak recovery, benefits more from a strong recovery, are vaguely indifferent to the United States economy, are impotent during the recession or are more interested in pursuing other agendas during the instability of mass unemployment. These numbers are certainly a point for those argument that the rich are doing just fine, and to whatever extent they’d be doing better with more robust growth and employment it isn’t putting a damper on their earnings. It’s also worth mentioning that, pre-Recession, inequality hadn’t been that high since the Great Depression, and we are looking to rapidly return to that state. It’s important to remember that a series of choices were made during the New Deal to react to runaway inequality, including changes to progressive taxation, financial regulation, monetary policy, labor unionization, and the provisioning of public goods and guaranteed social insurance. A battle will be fought over the next decade – it’s been fought for the past three years – on all these fronts. The subsequent resolution will determine how broadly-shared prosperity is going forward and whether or economy will continue to be as unstable as it has been. Right now the top tax bracket is earners over $388k, which is significantly less than the average income of the top 1% ($2.5 million). It seems like it would be a good idea to make a new top tax bracket and then increase taxes on them, to circumvent screwing over people who are (at least in major cities) essentially part of the middle class. $388k/y is nowhere near middleclass. Also the top rate is a marginal rate. And people chose to live where they want. Anyway, the obsession over taxes is a distraction. The REAL class warfare redistribution is perpetrated BEFORE employees receive their pay. Taxes are a minor % of pay. A big challenge in defending against classwarfarists is that they’ve illegitimtely accumulated a warchest over almost a century. 1. I include the execs&board among employees. They happen to also be the redistributors, so it’s obvious why the redistribution favors who it favors. Consider how many tax brackets there are between $38.8k and $388k (10x more). Yet people who make $388k and $388M (1000x more) are taxed at the exact same rate. $388k is MUCH closer (nearly 7x closer) to the median household income (~$44k) than to the mean income of the top 1% ($2.5M) and certainly of the top .1%. While individuals choose where to live, 1/4 of Americans live in cities 10% or more above the baseline CPI, and the most populous cities are significantly higher than this (NYC is more than double the baseline CPI). I think it’s a reasonable inference that more than 25% of top earners live in these major cities and thus have less relative wealth with their $300k. This is all to say that I don’t think $388k should be the top tax bracket anymore. It seems antiquated when most of the actual GDP earnings and true wealth go to individuals making 10x more than that and up.Nor is it advisable to tax this group heavily, since the group from $300k-$2.5M contains a lot of small business owners whose businesses could be compromised as a result. This does not even take into account capital gains, which allow the top earners to pay lower effective tax rates than almost all Americans. The point is simply that the idea that top earners should “pay their fair share” isn’t a new concept. In fact, what’s new is our choice to disregard this axiom entirely. Hi. Sorry to return days later. I agree that income taxes are not the only way, or perhaps even the best way, to address the problem of wealth polarization. However, I write about the US House whose primary constitutional responsibility is tax policy, so I have chosen to look at this aspect. IMO, that’s good. I see tax regulations as partly necessary mess, partly unnecessary mess. some freedom fighter’s mess can be traded for the ‘fascists’ favorite mess. I (am still) emphasizing that taxes are only a rate. The “privatized” redistribtion that precedes taxation applies to 100% of earnings. Some of the mess that fascist must give up is the legal rigging that enforces the earlier more punitive redistribution. We must prioritize easier (government taxation) and bigger (the rigging) items. Also, if you looked at my 2012-03-08]article, you would see that I know what a marginal tax rate is. Which is all the more reason why there should be another tax bracket, since our top tax rate is pretty fair for $300k-$2.5M earners, but historically lax on the top 1% of earners capturing most of the wealth. This is OK if more doable, then trade back as negotiating reforms. I don’t bargain like Obama bargains. If some slushfund bunny asks/begs special price off from the sticker price, I counteroffer with higher than sticker price. That’s my compromise. A graph would show a “wiggly” distribution of current rate “bumps” (y axis) across the incomes range (x axis). i think you suggest that ‘brackets’ be distributed evenly through incomes range… an indexing of rates. People would argue over “median based” and/or averaging based indexing formula.